(Minghui.org) Over the past 17 years, Falun Gong practitioners in China have been subjected to numerous methods of torture while illegally incarcerated in prisons, forced labor camps, detention centers, brainwashing centers, and psychiatric hospitals. Hanging heavy objects around the neck is among the most used torture methods. Mr. Ma Zhiwu, 46, a resident of Yingchuan City, Ningxia Autonomous Region, was sentenced to six years in prison in 2002. While serving his term in the Maguanhu Prison, he was hung up in the workshop during work hours. Prison guard Liang Haiwan ordered inmates to beat him with belts and batons, shocked him with electric batons, and hung a box filled with bricks around his neck. A bag of sand was put on top of his neck. Mr. Ma had to endure this abuse every day for two months. Mr. Liu Qingshui, a practitioner from Wuhan City, Hubei Province, was taken to Fanjiatai Prison on June 29, 2004. He protested the illegality of his imprisonment on August 18, 2004, and refused to do forced labor in the brick factory. Guard Xiao Tianbo ordered inmates to hang a sign and a steel wire with bricks tied at each end around his neck. The wire cut into his flesh. He was beaten and had his ribs broken when he refused to give in to their demands. Mr. Liu Peng, a teacher, was detained in the Shanghai First Forced Labor Camp from May 2000 to February 2002. He was forced to stand in a half-squatting position while holding a basin full of water. A toilet bucket about one and a half feet high was placed right in front of him. A guard hung the bucket using a steel wire around his neck. Mr. Zhang Guoliang from Hubei Province was taken to Qiquankou Prison in July 2001. Shortly after he arrived, guards ordered inmates to hang a bucket filled with water on a thin nylon rope around his neck. When any water was spilled, Mr. Zhang was beaten. After two hours, he was forced to stand at attention for an extended duration. The next morning, he was forced to do labor. He could barely lift his head due to the neck pain. Since he refused to renounce Falun Gong, he was tortured the same way the next evening. Another practitioner was tortured at the same time. The inmates forced this practitioner to lean his head on Mr. Zhang’s water bucket. The session lasted half an hour. Afterward, Mr. Zhang was unable to lift his head for an entire month. Practitioner Wang Guangyang from E’zhou City was taken to the same prison in April 2004 and subjected to the same abuse, which left marks on his neck still visible today. Mr. Zheng Zhiqiang, a practitioner from Dandong City, Liaoning Province, was tortured in Nanguanling Prison in Dalian City in the beginning of 2004. He was forced to stand in the snow from 6:00 p.m. to 7:00 p.m. each day. A wooden plate weighing about 35 pounds was hung around his neck. This lasted 17 days. He was tortured to death on April 4, 2004, at the age of 37. Mr. Feng Feng from Jingzhou City, Hubei Province was sentenced in 2008 to eight years in Fanjiatan Prison. On June 29, 2012, he was hung up by handcuffs. Two heavy wooden blocks were hung around his neck. He was left in this position for the entire night. Because of the resulting shoulder injuries, he still cannot perform any heavy labor. Mr. Zhang Chunqiu from Hunan Province was sentenced to eight years in Jin City Prison in 2001. On May 17, 2003, he was hung up with two hands behind his back and his feet above the ground. A wooden block, soaked in water and weighing about 160 pounds, was hung on a steel wire around his neck for more than 13 hours. (Minghui.org) Falun Gong practitioner Ms. Duan Xiaoyan was illegally tried in the Qingcheng County Court in Qingyang City, Gansu Province on August 16, 2016, even though she was in poor health and paralyzed from the waist down due to previous torture. Many police officers were present on the day of the trial. More than a dozen domestic security agents were allowed in the courtroom, but only two of Ms. Duan’s family members were allowed to attend the hearing. Mr. Wang Haijun who is Ms. Duan’s lawyer, questioned the judge about why he and Ms. Duan were not notified of the trial at least three days in advance, as required by the law, but the judge refused to answer. The judge repeatedly interrupted the lawyer throughout the trial and refused to speak Mandarin Chinese, making it difficult for the lawyer to understand him. The judge also criticized Ms. Duan when she spoke. Mr. Wang then requested the judge to recuse himself from the trial for denying Ms. Duan her legal rights. The court adjourned for about 30 minutes, but rejected the lawyer’s request. Personnel from the Gansu Province Political Directory and the “610 Office” tried to pressure Mr. Wang to drop his defense of Ms. Duan and threatened him, telling him not to mention anything about her spiritual belief during the trial. Ms. Duan, 46, had filed criminal complaints in June 2015 against Jiang Zemin, the former Chinese Communist dictator who had instigated the persecution against Falun Gong in 1999. She and other practitioners were then arrested in July 2015 by agents from the Xian City Political Directory, the “610 Office,” the Gaoxin District Police Department and the Changan District Police Department. Before the 2015 arrest, Ms. Duan had been arrested and held in forced labor camps many times because of her belief in Falun Gong. She was sentenced to seven years in Qinghai Women’s Prison, where she was severely tortured, including being shocked with electric batons. She became paralyzed from the waist down as a result. (Minghui.org) Tens of thousands of people held a protest against the construction of a trash incineration plant in Xiantao, Hubei Province on June 25 and 26, 2016. The local government mustered several thousand police to suppress the protestors, who were expressing their concerns about the environmental consequences of operating such a plant in their city. The local government had given a Hong Kong corporation approval to build the plant, despite the fact that similar trash incineration plants built by the company in other provinces caused grave pollution issues. Police beat the protestors violently and many people were arrested. The government blocked news about the protest and the crackdown by cutting the local power supply and censoring the internet and radio. Netizens managed to post videos of the police violence online briefly before Chinese internet police removed them. 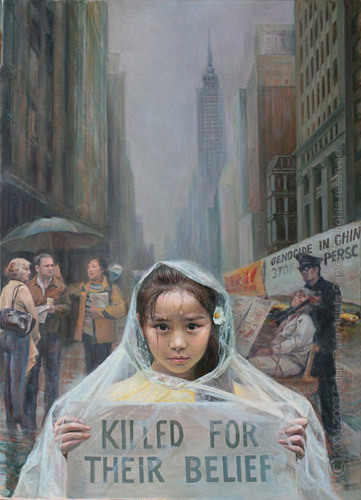 The Chinese Communist Party’s (CCP) persecution of Falun Gong has lasted more than 17 years. At least five practitioners in Xiantao have died from the persecution, one is missing, and 11 have been sentenced to prison. Many have been detained in detention centers or incarcerated in labor camps. Two practitioners are still imprisoned, five are detained, and several have been forced to leave their homes to avoid further persecution. The crackdown against the protestors in Xiantao and the persecution of Falun Gong highlight common threads regarding the CCP’s use of violence and lies. The public protest in Xiantao was an appeal to the government to withdraw approval for the construction of a trash incineration plant for the sake of the local environment. Such an issue could be peacefully resolved if administrative officials were willing to listen to the public. But CCP officials instead resorted to violence to suppress the protestors. Falun Gong teaches people to be good by following Truthfulness-Compassion-Forbearance. Because practicing Falun Gong helps improve health and morality, it quickly spread throughout China in the 1990s. Out of jealousy, Jiang Zemin, the then CCP leader, abused his power to initiate and maintain the state-sanctioned persecution of Falun Gong in July 1999. Many practitioners have been tortured to death. Many more have been imprisoned. The CCP even conducts state-sanctioned organ harvesting from live Falun Gong practitioners for lucrative profits. Falun Gong practitioners are a group of kind-hearted people. Practitioners peacefully and reasonably call for justice and call on the CCP to stop the persecution as soon as possible. Power outages and internet censorship, including key word filtering and barring video uploads, were applied in Xiantao on June 25, 2016. Thousands of police continued the violent crackdown the next day, and the internet censorship escalated. The government deleted all videos, images, or news relevant to the violent suppression, leaving only the official propaganda report created by state-run media. The CCP’s persecution of Falun Gong similarly involves intensive information censorship. The internet firewall was set up to censor and block all key words related to Falun Gong. Without circumventing the firewall, people in China cannot access authentic information about Falun Gong, only the government propaganda and slander. The CCP enforces surveillance and suppression of those Falun Gong practitioners who dare to raise awareness of the persecution to the general public. At the same time, it attempts to cover up the facts of Falun Gong to mislead the public. The local government enhanced internet censorship after the protest in Xiantao and published propaganda in state-controlled media, saying that the trash incineration plant will be high tech with low pollution. The truth is the Hong Kong corporation has already built highly toxic plants in other provinces that have seriously damaged the environment in those places. The CCP conducts the persecution of Falun Gong with all state apparatus, including military hospitals. It spreads lies and slander against Falun Gong on a large scale, including defaming Falun Gong with falsified deaths. It staged the Tiananmen self-immolation incident to deceive all of China via state run media in 2001. The CCP-controlled media, including newspapers, magazines, TV, and radio stations, have carried the lies again and again to defame Falun Gong and mislead people in China and throughout the world. The tens of thousands of Xiantao people who took part in the two-day protest forced the government to withdraw approval of the construction of the trash incineration plant. Without the protest, the government would have moved forward with the plant’s construction, and the people of Xiantao would have had to bear the pollution and other consequences. Falun Gong practitioners have conducted peaceful protests for more than 17 years. Their kindness and courage have moved countless people. Many Chinese citizens are now actively resisting the persecution and calling for Jiang Zemin to be brought to justice. (Minghui.org) A forum on “Human Rights Atrocities in China—Bringing Perpetrators to Justice” was held at the Rayburn House Office Building on May 26, 2016. Ten Falun Gong practitioners recounted the tortures they endured, and submitted the names of over 200 perpetrators to the U.S. Government, requesting further investigations and justice. Former dictator Jiang Zemin, the person who initiated the persecution, was one of the Chinese Communist Party officials and police officers named. All information on the perpetrators originated from the Minghui.org website. Representatives from the U.S. Congress, State Department, and U.S. Commission on International Religious Freedom (USCIRF) attended the forum. The Frank R. Wolf International Religious Freedom Act of 2015, introduced last month, aims to strengthen religious freedom protection through increased inter-agency cooperation, and sanctions against countries and individual perpetrators. Speakers at the “Human Rights Atrocities in China—Bringing Perpetrators to Justice” forum, which was held in the Rayburn House Office Building on May 26, 2016. The “death bed” is one of the many torture devices used by the Chinese Communist Party police on prisoners of conscience, especially Falun Gong practitioners. The victim is tied to a metal bed and not allowed to move for a long period of time. Other types of torture, such as forced-feeding, are employed at the same time. “They [guards in Heizuizi Forced Labor Camp] tied my limbs to a metal bed and inserted a rubber tube into my stomach to force-feed me. They pushed and pulled the rubber tube to inflict pain. I vomited the salty corn paste along with blood all over the place. They laughed. I noticed that one of them was taking pictures,” said Ms. Ma Chunmei from northeastern China, a “death bed” survivor who described one of the ways she was tortured in November 1999. She was a United Nations refugee, and resettled in the U.S. in September 2009. Ms. Ma was handcuffed to an upper bunkbed in 2000 after she protested in the labor camp cafeteria that she was being tortured. She was suspended with her feet off the ground, so that her arms and handcuffed wrists bore her entire weight. She vomited and fainted. Ms. Ma submitted a list of 79 perpetrators who were responsible for her suffering in a persecution aimed at coercing citizens to abandon their beliefs. Ms. Gao Rongrong died at the age of 37 on June 16, 2005. She suffered six to seven hours of non-stop high-voltage electric baton shocks on May 7, 2004, and was disfigured. The 610 Office, a Party-based security agency in charge of persecuting Falun Gong, and local police continued to harass the family after Gao Rongrong’s death. Her elder brother, once a senior editor of a newspaper, has been forced to leave home and move frequently to avoid harassment. Ms. Gao Weiwei, along with her father and another younger sister, made it to the United States in May 2014. She submitted a list of 88 names of people who were personally responsible for the death of her younger sister, Gao Rongrong. Ms. Abiola Afolayan, representative for Congresswoman Sheila Jackson Lee. “Falun Gong practitioners have long been subjected to systematic, brutal, bloody, and wholly unwarranted suppression and persecution,” said Congresswoman Sheila Jackson Lee of Texas in her statement. Ms. Tina Mufford, policy analyst, East Asia-Pacific, U.S. Commission on International Religious Freedom. Ms. Wang Chunyan displays photos of her friends who were tortured to death because they refused to abandon their belief in Falun Gong. Ms. Yin Liping was gang-raped in the notorious Masanjia Forced Labor Camp. She submitted the names of 42 perpetrators. (Minghui.org) A woman from Guanghan City was arrested for practicing Falun Gong, a spiritual belief that is persecuted in China, and tortured in a detention center and prison for three years. A year after her release, she was taken to a mental hospital and tortured for 10 months. The authorities in Deyang City scheduled four Falun Gong practitioners to be tried on March 7, 2011. The trial was a setup to lure other practitioners into the courthouse, where they were illegally arrested. The trial was then canceled. In total, 22 practitioners were arrested that day, including Ms. Yang Yonghui. In the police station the officers drew Ms. Yang’s blood without her consent and tortured her into giving up her address. The police then ransacked her home and confiscated her belongings. Ms. Yang was indicted three months later and, a year after that, sentenced to four and a half years in prison. She appealed, and her sentence was reduced to three years. During the appeal, she went on a huger strike to protest the persecution. The guards in Guanghan Detention Center handcuffed her to a bed and force fed her for a month. A few times the feeding tube was inserted into her windpipe instead of her esophagus, and Ms. Yang passed out from the pain. Ms. Yang was sent to Sichuan Province Women’s Prison. She refused to ask for permission to use the toilet, so the guards deprived her of sleep, forced her to do manual labor, and read materials that slandered Falun Gong. She was released in March 2014. Ms. Yang’s husband, who was deceived by the Chinese regime’s slanderous propaganda about Falun Gong, called the police on her in April 2015. Ms. Yang was taken to Guanghan Mental Hospital, where she was tied down on a bed and shocked with electric batons. She was also forced to take nerve-damaging drugs. Ms. Yang was released on February 3, 2016.